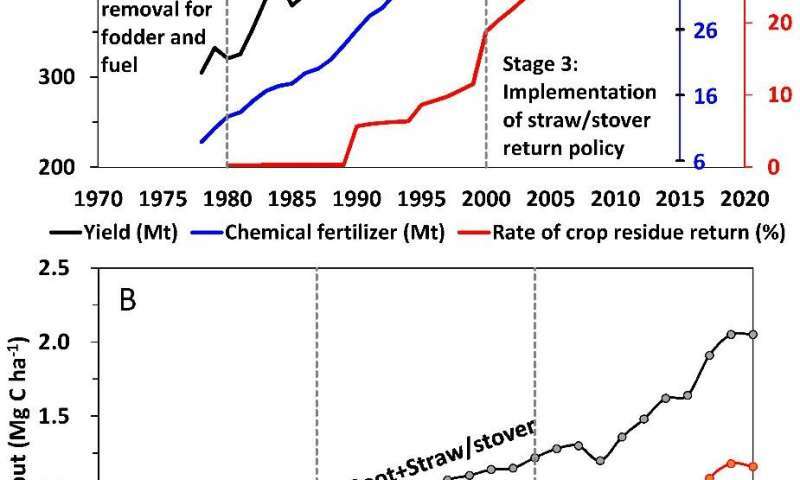 China's croplands have experienced drastic changes in management practices related to fertilization, tillage and residue treatment since the 1980s. The impact of these changes on soil organic carbon (SOC) has drawn major attention from the scientific community and decision-makers because changes in SOC may not only affect future food production but also water and soil quality, as well as greenhouse gas emissions. However, the underlying mechanisms that dominate the SOC dynamics of Chinese croplands on the national level are still not fully understood. Yet, knowledge of these mechanisms is critical for sustainable management of croplands, and thus supporting an increasing population, while maintaining their environmental function. Recently, scientists from the Institute of Soil Science (ISS) of the Chinese Academy of Sciences and collaborators conducted a comprehensive study that determined changes in SOC over the last three decades and identified the dominant agronomic, economic and policy drivers behind these changes and their implications for future carbon (C) sequestration in Chinese croplands. Based on the SOC and associated crop management data from 58 counties representing typical cropping systems across China, they found that the average SOC stock in the topsoil (0-20 cm) of Chinese croplands increased from 28.6 Mg C ha-1 in 1980 to 32.9 Mg C ha-1 in 2011, representing a net increase of 140 kg C ha-1 yr-1. Overall, cropland soils in China functioned as a significant carbon sink during this period. This SOC sequestration was largely attributed to increased organic inputs driven by economics and policy: While higher root biomass resulting from enhanced crop productivity by chemical fertilizers predominated before 2000, higher residue inputs following the large-scale implementation of crop straw/stover return policy took over thereafter, indicating that cropland SOC sequestration can be achieved through effectively manipulating economic and policy incentives to farmers. Their analysis also indicates that excessive nitrogen inputs and the inability to incorporate C residue into deeper soils will likely constrain future C sequestration in Chinese croplands. These findings provide new insights into the causes and limitations of economics- and policy-driven soil C sequestration in China and offer some guidance for soil C management in many developing countries that are going through similar economic and social transformations. The paper, titled "Economics- and policy-driven organic carbon input enhancement dominates soil organic carbon accumulation in Chinese croplands," was published in Proceedings of the National Academy of Sciences (PNAS).